In this study, karyotypes of three taxa in the genus Argyreia Lour. were examined. The chromosome counts for A. osyrensis and A. setosa were reported for the first time while somatic chromosome count of A. cuneata was confirmed. The three taxa studied were diploid with 2n = 2x = 30. 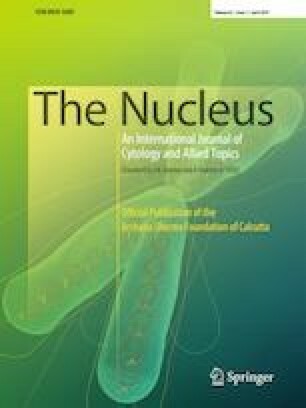 Highest total chromosome length in Argyreia osyrensis was 54.25 μm with mean chromosome length (MCL) of 3.62 μm. The lowest in Argyreia setosa as 46.04 μm with the mean chromosome length of 3.07 μm. The karyotypes of the species were examined on the grounds of various karyotype asymmetry indices. Two of them, A. cuneata and A. osyrensis fell in the 3A while A. setosa belonged to the 4A category of Stebbins’ classification. Authors are grateful to Head, Department of Botany, Shivaji University, Kolhapur and Dr. M.M. Lekhak for providing laboratory facilities and valuable suggestions. Financial support received from the Council of Scientific and Industrial Research (CSIR), India, to PRL (CSIR file no. 08/631(0001)/2015-EMR-I Dated: 04/11/2015) is gratefully acknowledged.